The following article, “The French Cavalry School” , was published in the Washington Post on April 30. 1893. This article was written more than a decade prior to Guy V Henry graduating from Saumur and more than two decades before Harry Chamberlin attended Saumur. The article is also written well before the advent of Caprilli’s forward method. Today the Cadre Noir de Saumur and the French national horse riding school have their roots in The French Cavalry School at Saumur and they remain active in performance, rider training and with the French Federation of horse riding. 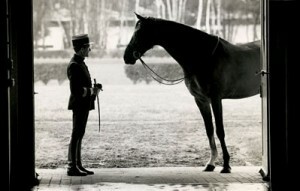 You can visit the web site of the Cadre Noir and the French national riding school at http://www.cadrenoir.fr/en/le-Cadre-noir And don’t miss the video at the top of the page….. This Ecole de Cavalerie was established in 1764, together with four similar academies by the Duc de Choiseul. Its first home was at La Fleche but in 1768 it was transferred to Saumur. For a time its history pursued a somewhat checkered course. The revolution suppressed it, and the empire founded a substitute for it at St. Germain-et-Laye. In 1814, through the exertions of Marshal Souit, it was reopened at Saumur, only to be closed again nine years later in favor of a rival at Versailles. In 1825, however, it was reorganized at Saumur on a new basis; and except for another reorganization in 1853 its progress has been but little disturbed since then, says a writer in Harper’s Weekly. The institution is not so much a school of cavalry as a cavalry high school. It does not confine itself to mere training in horsemanship, but aims at giving the cavalry officer a comprehensive insight Into the various branches of his profession. Thus, beside the riding schools, there are a school of telegraphy, a. veterinary school, a shoeing school, and even workshops in which all kinds of useful arts and crafts are taught. Elementary riding is, of course, not taught. The students are supposed to be able to ride more or less well before they enter, and the province of the school is to complete their education in this respect, and, at the same time, give them a practical knowledge of the multifarious duties of a cavalry officer. Everything, of course, cannot be learned during the eleven months which the course of study lasts, but the instruction is specially adapted to stimulate the student to further self-culture when they leave the institution. Nor is the school confined to cavalry officers. Students are likewise supplied by the artillery and engineer corps. “There are five divisions in the school. The first comprises officers of cavalry or artillery regiments who present themselves voluntarily. The second consists of sub-lieutenants, who have been for a year with their colors. Formerly these young officers were sent from St.-Cyr direct to Saumur, but it has been found necessary to give them some regimental experience before drafting them into the cavalry school. ln the third division are non-commissioned cavalry and artillery officers selected at the rate of one for every two regiments. In this selection preference is given to those who are marked for promotion to sub-lieutenaucies. The fourth division consist of brigadiers, of whom each cavalry regiment Is entitled to send one. They must be men who have shown a special aptitude for horsemanship, and who are intended for promotion. The fifth division is reserved for what are called cavaliers eleves, being men who wish to join cavalry regiments, and who, on satisfying the exigencies of the curriculum, are drafted into the army with the rank of brigadier. Besides these chief divisions, there are the aforementioned veterinary and telegraph schools. The veterinary students are taught riding , besides the mysteries of equine pathology, and their course lasts twelve months. The telegraph school has two divisions, one for elementary pupils and the other for advanced pupils. ln the riding schools the officers are taught to break in horses, special attention being given to this branch of their education. There are also special classes in tactics, topography, history, military geography, fortification, and the German language. The school is under the direct authority of the minister of war, anti is placed in charge of a general of brigade, who is assisted by a very large staff. A considerable military force is also stationed at the school. It can receive between 2,000 3,000 subaltern officers, but, it rarely contains more than 500, besides 100 workmen. An immense number of horses is kept at the school, in addition to those supplied by the officers themselves. There are hunters and racers as well as chargers, the students being encouraged under certain conditions to cultivate sports of all kinds. Under the present administrative system, which is far more severe than that formerly in use, the efficiency of the Saumur school bas been vastly improved , and is now turning out a generation of cavalry officers whose intelligence, accomplishments, and espirit de corps have earned the admiration of many unbiased military experts. Whether the French will ever have as good a cavalry as the Germans it is difficult to say. One thing, however, is certain: if assiduous practice, patient and intelligent training, and a soldierly enthusiasm can bring about this result, it will eventually be attained. To this end the Saumur school will have chiefly contributed. Thanks for joining me at U.S. Horsemanship. If you enjoyed this article and would like to follow this blog you can do so automatically one of two ways. You can go tot he subscribe page at the top of this web site or you can use the handy form on the main page. And when you sign up you’ll receive a copy of the French Cavalry Manual which had huge influence on our Cavalry School at Fort Riley. While you’re at it, why not take a peek at my other blogs? http://theridinginstructor.net is for instructors, students of horsemanship, and/or their significant others ; wives, husbands , parents….I think that about covers all of us. http://fshrenoslegacy.net is the log of my progress and life with newly acquired, all American, Mustang yearling, Reno’s Legacy. He’s been here less than 3 months and I don’t know who’s learned more, Reno or me. Thanks for reading U.S. Horsemanship. I love to receive your comments…your feedback keeps me looking for topics that I think are interesting to you.